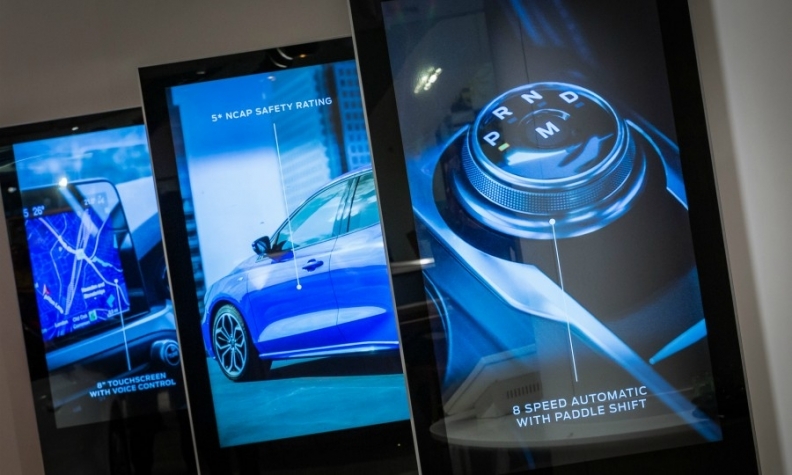 The online buying process is shown on interactive displays at a Ford showroom in Manchester, England. Ford Motor has begun online sales in the UK and may extend the program across Europe. Ford has twice previously attempted online sales in the UK, its biggest European market, once in 1999 and the second time in 2010. However, Ford now believes the market is ready. "We were well ahead of ourselves in 1999. A car was then deemed too big a commodity to buy online. A generation on and the time is right," a company spokesman said. All cars available on the www.buy.ford.co.uk site are purchased using Personal Contract Purchase (PCP) finance, the most popular method of buying a car in the UK for private customers. The new car is delivered to the customers' home and Ford works with an auction company to trade in their old car. A test drive can be arranged at a local dealer. Ford did not give sales targets for online sales. The idea could be rolled out across Europe if it proves popular. "The UK does a third of our volume in Europe, so it goes first, but other markets will be watching," the spokesman said. The launch of the online site is linked to the opening of a new Ford showroom in the Arndale shopping center in Manchester, northwest England. The store has a display of five vehicles and uses the same online buying process as the website via interactive displays. The Manchester store is operated by Rockar, a dealership which has had previous success with two Hyundai franchises in shopping centers in the south of England. Rockar has since opened a Land Rover store in a London shopping center. The same format has also been trialed by Opel in Germany.